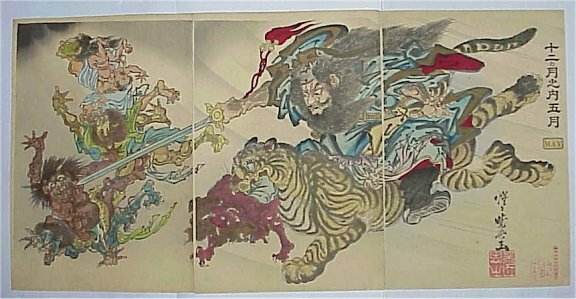 Shoki riding a tiger and attacking a group of demons. “May” from a series of Twelve Months. Published by Fukuda Kumajuro Meiji 20 (1887). Fine impression and colour. Minor sumi spots, otherwise very good condition. (This design is often trimmed for albums and does not match.) Signed Shojo Kyosai ga.